(C) 2011 Karin Voigtländer. This is an open access article distributed under the terms of the Creative Commons Attribution License 3.0 (CC-BY), which permits unrestricted use, distribution, and reproduction in any medium, provided the original author and source are credited. The Red Lists of endangered species published by the German Bundesamt für Naturschutz (BfN - the Federal Agency of Nature Conservation) are essential tools for the nature protection in Germany since the 1970s. Although many groups of insects appear in the German Red Lists, small and inconspicuous soil organisms, among them millipedes and centipedes, have in the past been ignored. In the last few years great efforts have been made to assess these two groups, resulting in Red Lists of German Myriapoda. However, difficulties were encountered in strictly applying the Red List classification criteria to myriapods. Here we discuss those problems and some sources of error. A species list of all German Diplopoda and Chilopoda including Red List status and frequency of occurrence is provided in an Appendix. The basis of all protection measures are studies of the distribution and endangerment of species and habitats. For this purpose the so-called “Red Lists” are expert scientific reports which document and evaluate the current degree of endangerment on the basis of population size and population dynamics (vulnerability analysis). They indicate a (possible) need for conservation actions and have other useful functions (Figure 1). 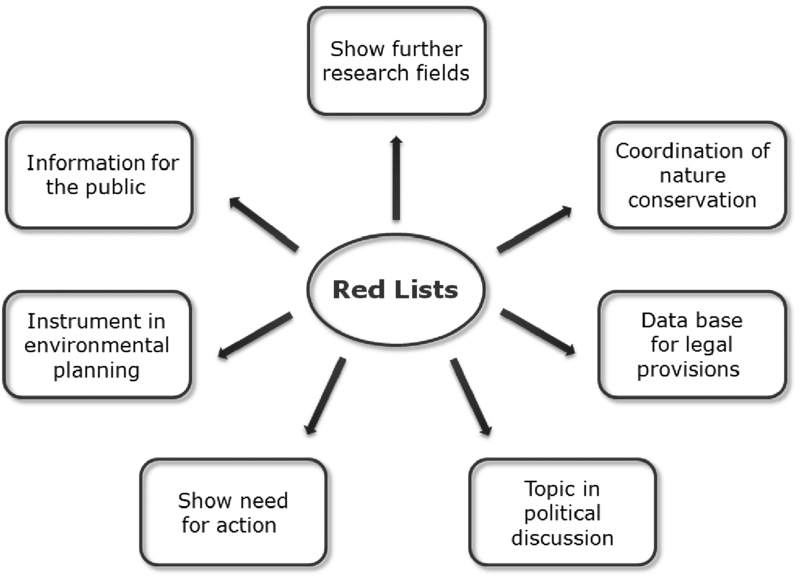 Red Lists are essential instruments for environmental planning and assessments and are publicly available statements of expert opinion (Schuboth and Peterson 2004). Hardly any other scientific publication has the political consequences of a Red List. Endangered species Red Lists were prepared for the first time in 1963 (IUCN Red List of Threatened Species). In Germany nature protection practice has operated with Red Lists since 1970. In South Africa and Australia, conservation decisions may be based on endangered myriapod species (mostly short range endemics) (Hamer et al. 2006, Hamer and Slotow 2009, Framenau 2011, Pfab et al. 2011). The current international Red Lists of the International Union for the Conservation of Nature (IUCN) includes only a few Myriapoda: Scolopendra abnormis from Mauritius and 31 species of Doratogonus from South Africa. In recent years some European countries have published national Red Lists including myriapods: Slovenia (Kos 1992, Mrsic 1992), Czech Republic (Kocourek 2005) and Norway (Djursvoll and Meidell 2006, Djursvoll 2010). To enable myriapods to be considered in German conservation planning, the authors prepared Red Lists for German Chilopoda and Diplopoda between the years 2005 and 2010 (Spelda et al. in press, Reip et al. in press). In the present paper we summarize the resulting Red Lists and discuss some difficulties and problems we encountered during the assessment process. For the details of the classification and categorization protocols used in that process, see Spelda et al. (in press) and Reip et al. (in press). The Red Lists of Germany are edited and published by the Bundesamt für Naturschutz (BfN). They have recorded extinct, missing or vulnerable species of animals, plants, mushrooms and plant communities since the 1070s (e.g. DS/IRV 1971, Sukopp 1974). Since 1994 biotope types have also been listed (Riecken et al. 1994). The principles and methods involved in preparing Red Lists are frequently refined (e.g. Blab and Nowak 1989, Schnittler et al. 1994, Ludwig and Schnittler 1996, Ludwig et al. 2009a, 2009b). Up to the year 2009, 16, 000 German animal species (vertebrates and selected invertebrate groups) have been evaluated for their degree of endangerment on the Red Lists. The proportion of German animal species not considered in the Red Lists to all German animal species is estimated to be 45% (Binot-Hafke et al. 2009), and among the unconsidered species are soil animals such as myriapods. Although many groups of insects have been well-documented for many years, this is not the case for soil fauna (Dunger 1996). Most soil animals, including millipedes and centipedes, are small and inconspicuous. They are considered unattractive and attract little public interest. But in the last 20 years the approach to these animal groups has clearly changed. Proposals of Red Lists have been made for isopods by Grünwald (1990) for the federal state of Bavaria and by Knorre (2001) for Thuringia. For diplopods and chilopods, lists were established by Spelda (1999, 2004) for Baden-Württemberg and Bavaria as well as by Voigtländer (2004a, 2004b) for Saxony-Anhalt. This change followed passage of the soil protection law in 1998 (BBodSchG 1998), which explicitly demands the protection of soil as habitat for mankind, animals and plants. As a result, the preservation of diversity and function of soil organism communities came into focus and the need to increase scientific knowledge of soil organisms had been recognized. In contrast to many other Arthropoda, myriapods show a very low tendency to disperse. Even in Germany there occur several endemic species with very small distribution ranges. 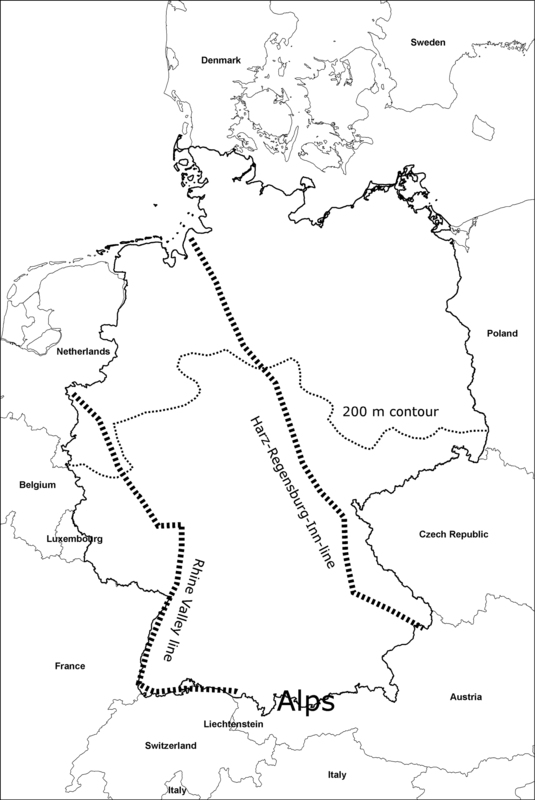 Furthermore, the German myriapod fauna shows remarkable differences east and west of an invisible boundary passing from the Harz Mountains over Regensburg south to the Inn as well as the Rhine Valley line (Figure 2). Another common distribution limit is the 200 m elevation contour, which runs crosswise through Germany and and separates the northern lowland fauna from the southern low mountain range fauna. Entirely different faunas occur in the far south of Germany, in the Alps and the Black Forest. Myriapods are thus particularly good subjects for biogeographical analyses. 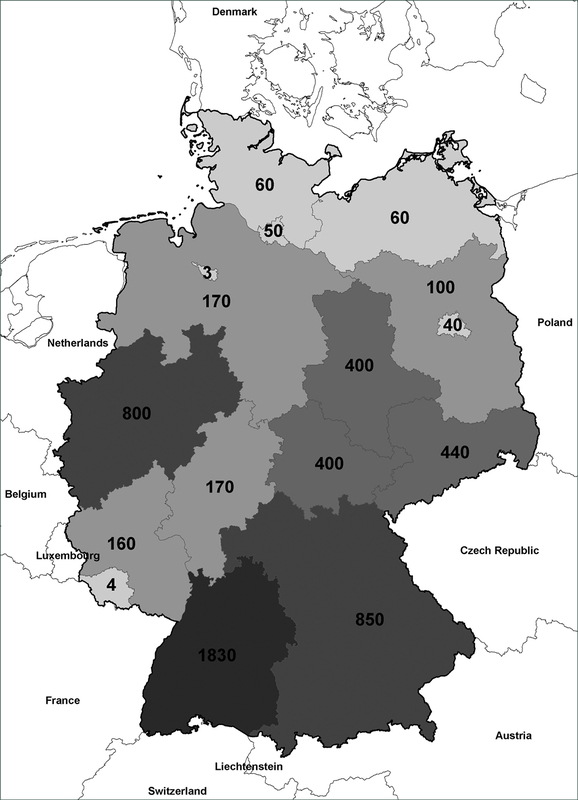 Shared distribution limits for myriapods in Germany. Myriapods, especially the diplopods, are highly suitable for biological site-characterization (Römbke et al. 2000). There exist not only characteristic species for sites (Voigtländer 2003a, 2003b, 2005), but also site-typical communities with special species compositions and dominance structures (Ruf et al. 2000, Voigtländer and Düker 2001, Voigtländer 2003c). Some species react very quickly to changes in environmental conditions, and are therefore valuable in monitoring the rehabilitation of disturbed sites (e.g. Dunger and Voigtländer 2005, 2009). A final reason for improving the conservation status of Diplopoda and Chilopoda through Red Lists is that they are regarded as “living fossils” (Edgecombe 2010, Shear and Edgecombe 2010) and hence have an intrinsic as well as a utilitarian conservation value. Although the application of the Red List protocols to myriapods is detailed elsewhere (Spelda et al. in press, Reip et al. in press), we offer here a brief overview as background for the discussion that follows. The methods and procedures for Red List assessments are fixed by the BfN (Ludwig et al. 2009a). They deviate in some respects from the IUCN method (IUCN Standards and Petitions Subcommittee 2010) because these rules are not completely applicable on a national basis. A critical review of the IUCN methods in respect of national requirements and their consequences is given in Haupt et al. (2009). To get comparable results for all assessed German species groups it is not possible to modify methods greatly. In previous years, species vulnerability and degree of endangerment were evaluated with the help of defined categories, based on various quantitative criteria. Now the procedure has changed so that the criteria and their definitions are in the foreground. The new method is described in Ludwig et al. (2009a). Standardised classes for each criterion are introduced to make the classification more understandable and verifiable. In contrast to most other countries and previous versions of Red Lists, the BfN has demanded a complete list of all German diplopods and chilopods and an assessment of their current status (see Appendix). For the analysis several parameters have to be considered (population size, number of occurrences, grid or areal data, habitats). For myriapods the key data would be the number of occurrences and if available the population size and habitats. Six frequency of occurrence classes can be distinguished (extremely rare, very rare, rare, moderately frequent, frequent, very frequent) which are supplemented by the classes “extinct or lost” and “unknown”. The short– and long–term trend criteria enable the consideration of changes of the population size over the time. By a comparison of both trends the reliability of the results of the Red List is increased. If the number of records is not very large, an evaluation is also possible by using only one trend criterion, either short- or long-term. In taxa with large and irregular fluctuations within populations the short-term trend criterion should be ignored. For the long-term population trend of myriapods we compared the situations before and after 1950. Species recently added to the German fauna are classified as “data insufficient” for this criterion. If it is well-established that the population of a species will decline during the next 10 years, risk factors have to be considered. The prospective effect of risk factors rather than the total number of factors should be of greater importance for the overall evaluation. Importantly, the method of Ludwig et al. (2009a) also measures national responsibility, by evaluating the endangerment status of a species over the whole of its range, and not only in Germany. The classification of degree of endangerment (categories) is determined by a standardised classification scheme set by the BfN (see Ludwig et al. 2009a) which operates in a constant and uniform manner for all species. After data input, a spreadsheet provided by the BfN calculates the endangerment levels automatically and carries out consistency tests for the core information entered. The myriapod Red Lists are based on an ongoing and systematic recording of the German myriapod fauna by the Working Group of the German Speaking Myriapodologists (http://myriapoda.info/agdm/agdm.htm). Evaluations are based on species lists from more than 5, 500 localities (often with several investigated habitats in each) from 1960 to 2010. Altogether over 150, 000 specimens were considered. Additionally, a part of the myriapod literature of Germany was examined, and species lists from over 1, 000 locations were added to the analysis. For details see Spelda et al. (in press) and Reip et al. (in press). There was insufficient data for an evaluation of Symphyla and Pauropoda, due to a lack of experts, collections and current investigations. There are no indications the situation will change in the near future. Tally of the species and Red List categories (modified from Spelda et al. in press, Reip et al. in press). Percentages rounded. The present Red List of the German myriapod species has to be regarded as a first attempt at estimating degrees of endangerment for species in this neglected group. It is not surprising that difficulties exist, which we list below. In addition, we will provide some recommendations for further research. The assessment of some species is negatively affected by a lack of area-wide data. A clear division between the South and the North of Germany is obvious (Figure 3). Most records are from southern Germany (Baden-Württemberg, Bavaria) in contrast to only a few records from the northern federal states of Schleswig-Holstein and Mecklenburg-West Pomerania. Recent records are particularly scarce in the last mentioned regions, e.g. for Leptoiulus cibdellus. These under-represented areas should be the focus of future sampling. Such observation gaps also existed in the past. Each of the “pioneers” of German myriapodology had more or less his own collection area, e.g. Verhoeff in southwestern Germany or Schubart in the northeast. This bias complicates the assessment of long-term trends outside these favoured areas. Approximate numbers of sampled sites in the federal states of Germany. Recommendation: During the assessment process each species must be studied and discussed in detail. This is done in depth in our Red Lists of German chilopods and diplopods (Reip et al. in press, Spelda et al. in press). Often the number of available records does not allow the calculation of exact numerical terms for the criteria, e.g. if there are only sporadic records of single specimens or a few records in greater intervals. Recommendation: Frequency classes should be established on the basis of accurate numerical ranges, if possible. When this is not possible, interpolation or expert opinion becomes relevant and legitimate. At the present time it is not possible to provide a short-term population trend for any German myriapod species. It can be assumed, however that such a trend will often be overlaid by the natural range of fluctuation. Recommendation: This criterion should be ignored (legitimately according to Ludwig et al. 2009a). The criteria for the analysis of endangerment can be effectively applied to many animal groups, but they are less suitable for Myriapoda. Given the small amount of data available for myriapods, strict use of these criteria has the result that one fourth of the German chilopod species and more than one third of the diplopod species should be Red Listed. The method of Ludwig et al. (2009a), as applied in the automatically calculating Excel spreadsheet provided by the BfN, produced in only a few cases the risk categories “EU” (endangerment of unknown extent) or “D” (data deficient). The assessment system does not allow the expert to override an assignment. For example, a species is automatically classified in the categories 1 to 3 if it is ranked as “extremely rare” in combination with certain other criteria states, whether or not the “extremely rare” ranking is based on an adequate number of records. Recommendation: Doubtful cases needs to be discussed in the comments to the Red Lists. The taxonomic status of most German diplopods and chilopods is well established. In some species or species groups, however, the taxon’s validity at the species level has been disputed or neglected in the past or is still uncertain. This results in incomplete or inaccurate knowledge of the distribution, trends and risks for these species. A careful taxonomical revision is needed for several questionable species or subspecies, e.g. the Ochogona regale and Ochogona triaina, and Ophyiulus major and Ochogona pilosus. When compiling the Red Lists, we found that historically misapplied species names (e.g. Glomeris tetrasticha and Glomeris connexa) and closely related, easily misidentified species (in the Lithobius lapidicola-group, Lithobius mutabilis-group and Geophilus proximus-group) needed to have all records rechecked. Recommendation: Taxonomic status needs to be discussed in the comments to the Red Lists. Standardised and appropriate capture methods are necessary. Pitfall trapping, sieving and hand sampling are regularly used for myriapods, but not all methods are equally suitable for all myriapod species in all habitats. Recommendation: Sampling should include a wide range of methods, such as soil sampling or tree traps (e.g. for Macrosternodesmus palicola, Propolydesmus germanicus or Lithobius pelidnus). For some species, there have been no records in Germany for 50 years or more, e.g. Clinopodes flavidus, Polydesmus susatensis and Strigamia maritima. These have been classified as “extremely rare” and not as “extinct or lost”. It is possible that these species haven’t been found again merely by chance. In one case, the millipede Bergamosoma canestrinii, a “lost” species was rediscovered in 2010 (unpublished data). Recommendation: Targeted searches at known localities and in the surrounding areas are necessary to determine whether a species is really lost. In some cases “extremely rare” and “very rare” may be incorrect. If there are limited records, an overlooked population could have a major effect on the conservation status of the species, e.g. for Haploporatia eremita. A biotope or habitat evaluation derived from species with only a few records does not always reflect the real situation. Recommendation: Targeted searches of the area surrounding known records and in equivalent habitats in other regions are necessary to improve knowledge of rarity. If the choice of “extremely rare” or “very rare” is unclear, the species should be classified as “extremely rare”, because this increases the chances that the species will be given a high priority for further study. For many myriapod species, especially for diplopods, the loss of biotope or habitat plays an important role in endangerment classification. If a threatening event affects a species with a very small distribution area this implies the possible extinction of the species. In Germany this is the case with Rhymogona serrata. If the proposed High Rhine highway is built, a large proportion of the mere 100 km2 distribution area of this extremely short-range endemic species would be destroyed. Germany has the greatest responsibility for the conservation of Rhymogona serrata, which additionally occurs only in a small belt in adjacent Switzerland near Basel. In the case of xeric or mesoxeric meadow-species a loss of natural or semi-natural sites is assumed to be caused by bush encroachment, afforestations, etc. Some elements of the Pannonian fauna reach their northwestern border in Germany, e.g. Megaphyllum unilineatum. Even though this species still occurs quite commonly in its main distribution area, local decrease on the western edge of the area is considered to be critical as shown by Spelda (1999). Recommendation: In all cases, knowledge of the autecological requirements of species in relationship to their distribution area and also knowledge of possible alternative habitats is very important and should be studied. The following risk factors must be weighed: “direct human effects” (e.g. building measures), “loss of habitat”, “re-colonisation hindered for species with a small distribution area which have not been rediscovered to date”. In Germany, the number of endemic species is quite small (six species) in comparison to other European countries, e.g. Austria, 18 diplopods (Gruber 2009); Slovenia, 56 diplopods (Mrsic 1992); and Bulgaria, 23 chilopods (Stoev 2002). The German endemics are all Diplopoda: Glomeris malmivaga, Pyrgocyphosoma titianum, Rhymogona verhoeffi, Rhymogona wehrana, Rhymogona serrata and Xylophageuma vomrathi. All these species have a very small distribution area in the Black Forest, the Swabian (Baden-Württemberg) or the Franconian Jura (Bavaria). Short-range endemism is a risk to a species and the risk can be increased if additionally the habitat of the species is endangered e.g. by human activity (see above for Rhymogona serrata). Recommendation: Endemism is always strongly connected with national responsibility. The conservation of endemic species should always be considered in planning projects and substantial human activities. Therefore endemic and subendemic species should get the risk factor “resettlement under less favourable conditions”. Many species, including extremely rare species, have their distribution limits within Germany (Figure 2). For German species with a small distribution area within Europe, shared by different countries, the so-called subendemics, there is a high German responsibility for their protection, e.g. Haasea norica, Pteridoiulus aspidiorum and Bergamosoma canestrinii. For species more widely distributed in Europe, the German responsibility is lower: e.g. Eupolybothrus grossipes and Schendyla tyrolensis. Recommendation: For assessing the level of national responsibility the whole of a species distribution area, its degree of fragmentation as well as local abundances have to be examined and evaluated. Alien species are non-indigenous species that have been introduced by direct or indirect human activity since 1492 (Ludwig et al. 2009a). Among the myriapods, such species are often extremely or very rare, representing single introduction events or lack of data in urban areas. Alien species are included in the Red List, but they are not evaluated and therefore they do not get an endangerment status. In some cases it is not clear if a species is an alien or an indigenous species at its distribution limit, e.g. Henia vesuviana and Stigmatogaster subterranea. Recommendation: If it is unclear whether or not a species is alien, it should be evaluated. We have prepared Red Lists for Diplopoda and Chilopoda as a first step in raising the conservation profile of these groups in Germany (Spelda et al. in press, Reip et al. in press; Appendix below). These lists are based on available knowledge and it became clear as we compiled them that we faced several “start-up problems” during the evaluation process. However, lack of detailed knowledge (e.g. of distribution, frequency of occurrence, effects of contaminants) should not be allowed to hinder the compilation of Red Lists. German nature protection practices (environmental planning, surveys and reports) value biotopes according to their conservation status, which is mostly measured by the occurrence of Red List species. Without proof of existence of such species, funds may not be allocated for further studies in those biotopes. On the other hand, without these funds we cannot build an increased, detailed knowledge base of threatened species. This problem, however, must not lead to a deviation from clear scientific methods towards mere scientific politics. Results must always be replicable and well founded. The work reported here shows that millipedes and centipedes are worthy of and in need of protection, and Red Lists provide nature conservation efforts with a powerful management tool for conserving these groups. We are very grateful for the extensive support of Norman Lindner (Leipzig). We thank also Michel Hamer (Pietermaritzburg) and an anonymous reviewer for their critical and helpful remarks and Vera Wilkin (Rochester) and Robert Mesibov (Penguin) for their help in improving our English. BBoDSchG – Bundes-Bodenschutzgesetz BGBl. I, 502 (1998) Gesetz zum Schutz vor schädlichen Bodenveränderungen und zur Sanierung von Altlasten. Binot-Hafke M, Gruttke H, Haupt H, Ludwig G, Otto C, Pauly A (2009) Einleitung und Einführung in die neuen Roten Listen. In: Ludwig G, Haupt H, Gruttke H, Binot-Hafke M, Otto C, Pauly A. (Eds) Rote Liste gefährdeter Tiere, Pflanzen und Pilze Deutschlands. Band 1: Wirbeltiere. Naturschutz und Biologische Vielfalt 70 (1): 9-18. Blab J, Nowak E (1989) Zehn Jahre Rote Liste gefährdeter Tierarten in der Bundesrepublik Deutschland. Schriftenreihe für Landschaftspflege und Naturschutz 29: 1-321. Djursvoll P (2010) Mangeføttinger - Myriapoda. In: Kålås JA, Viken Å, Henriksen S, Skjelseth S (Eds). Norsk rødliste for arter 2010. Artsdatabanken, Norge: 223-226. Djursvoll P, Meidell B (2006) Mangeføttinger - Myriapoda. In: Kålås, J.A., Viken, Å. og Bakken, T. (red.). Norsk Rødliste 2006 – 2006 Norwegian Red List. Artsdatabanken, Norway, 207–210. DS/IRV (Deutsche Sektion des Internationalen Rats für Vogelschutz) (1971) Die in der Bundesrepublik Deutschland gefährdeten Vogelarten und der Erfolg von Schutzmaßnahmen. Berichte der Deutsche Sektion des Internationalen Rats für Vogelschutz 11: 31-37. Dunger W (1996) Sind Bodentiere schützbar und schutzwürdig? Wissen und Wissenslücken zur Entomofauna mitteleuropäischer Böden. In: Gerstmeier R, Scherer G (Eds). Verhandlungen des 14. Internationalen Symposiums über Entomofaunistik in Mitteleuropa (SIEEC) 4.-9. September 1994, München: 99-115. Dunger W, Voigtländer K (2005) Assessment of biological soil quality on wooded mine sites. Geoderma 129(1–2): 32-44. Dunger W, Voigtländer K (2009) Soil fauna (Lumbricidae, Collembola, Diplopoda and Chilopoda) as indicators of soil ecosubsystem development in post-mining sites of Eastern Germany – a review. Soil Organisms 81 (1): 1-51. Edgecombe GD (2010) Arthropod phylogeny: An overview from the perspectives of morphology, molecular data and the fossil record. Arthropod Structure and Development 39: 74-87. Framenau VW (2011) The millipede genus Antichiropus (Polydesmida: Paradoxosomatidae) and its role in the conservation arena of Western Australia. In: Proceedings of the 15th International Congress of Myriapodology 2011, Brisbane, Australia: 5. Gruber J (2009) Diplopoda (Doppelfüsser). In: Rabitsch W, Essl F (Eds). Endemiten – Kostbarkeiten in Österreichs Pflanzen- und Tierwelt. Naturwissenschaftlicher Verein für Kärnten und Umweltbundesamt GmbH, Klagenfurt und Wien: 512-541. Grünwald M (1990) Vorschlag einer Roten Liste der in Bayern gefährdeten Landasseln (Isopoda, Oniscidea). Schriftenreihe Bayerisches Landesamt für Umweltschutz 99: 183-186. Hamer ML, Slotow RH (2009) A comparison and conservation assessment of the high-altitude grassland and forest-millipede (Diplopoda) fauna of the South African Drakensberg. Soil Organisms 81 (3): 701-717. Hamer ML, Slotow RH, Lovell S (2006) The South African savanna millipede (Diplopoda) fauna: taxonomic diversity, endemism spatial and temporal effects on conservation assessments. Norwegian Journal of Entomology 53 (2): 321-334. Haupt H, Ludwig G, Otto C, Schnittler M, Matzke-Hajek G, Gruttke H (2009) Kritische Betrachtung der IUCN-Methode zur Erstellung Roter Listen. In: Ludwig G, Haupt H, Gruttke H, Binot-Hafke M, Otto C, Pauly A (Eds). Rote Liste gefährdeter Tiere, Pflanzen und Pilze Deutschlands. Band 1: Wirbeltiere. Naturschutz und Biologische Vielfalt 70 (1): 23-71. IUCN Standards and Petitions Subcommittee (2010) Guidelines for Using the IUCN Red List Categories and Criteria. Version 8.1. Prepared by the Standards and Petitions Subcommittee in March 2010. http://intranet.iucn.org/webfiles/doc/SSC/RedList/RedListGuidelines.pdf. Knorre D (2001) Rote Liste der Asseln (Crustacea: Isopoda) Thüringens. Naturschutzreport 18: 64-65. Kocourek P (2005) Diplopoda (mnohonožky). In: Farkač J, Král D, Škorpík M (Eds) Červený seznam ohrožených druhů České republiky. Bezobratlí. [in Czech with English abstract]. Agentura ochrany přírody a krajiny ČR, Praha: 108–109. Kos I (1992) The Red List of endangered Chilopoda in Slovenia. [in Slovenian]. Varstvo Narave 17: 137–146. Ludwig G, Schnittler M (1996) Rote Liste gefährdeter Pflanzen Deutschlands. Bonn Bad Godesberg (Bundesamt für Naturschutz). Schriftenreihe für Vegetationskunde 28: 744 pp. Ludwig G, Haupt H, Gruttke H, Binot-Hafke M (2009a) Methodik der Gefährdungsanalyse für Rote Listen. In: Ludwig G, Haupt H, Gruttke H, Binot-Hafke M, Otto C, Pauly A (Eds). Rote Liste gefährdeter Tiere, Pflanzen und Pilze Deutschlands. Band 1: Wirbeltiere. Naturschutz und Biologische Vielfalt 70 (1): 23-71. Ludwig G, Haupt H, Gruttke H, Binot-Hafke M, Otto C, Pauly A (2009b) Rote Liste gefährdeter Tiere, Pflanzen und Pilze Deutschlands. Band 1: Wirbeltiere. Naturschutz und Biologische Vielfalt 70 (1): 1-386. Mrsic N (1992) The Red List of endangered Diplopoda (Myriapoda) in Slovenia. [in Slovenian]. Varstvo Narave 17: 131–136. Pfab MF, Victor JE, Armstrong AJ (2011) Application of the IUCN Red Listing system to setting species targets for conservation planning purposes. Biodiversity and Conservation 20 (5): 1001-1002. Reip HS, Spelda J, Voigtländer K, Lindner EN, Decker P, Hauser H (in press) Rote Liste der in Deutschland gefährdeten Tausendfüßer (Myriapoda: Diplopoda). In: Bundesamt für Naturschutz (BfN) (Ed) Rote Liste gefährdeter Tiere, Pflanzen und Pilze Deutschlands. Naturschutz und Biologische Vielfalt. Riecken U, Ries U, Ssymank A (1994) Rote Liste der gefährdeten Biotoptypen der Bundesrepublik Deutschland. Schriftenreihe für Landschaftspflege und Naturschutz 41: 1-184. Römbke J, Dreher P, Beck L, Hammel W, Hund K, Knoche H, Kördel W, Kratz W, Moser T, Pieper S, Ruf A, Spelda J, Woas S (2000): Bodenbiologische Bodengüte-Klassen. UBA-Texte 6/00, 276 pp. Ruf A, Beck L, Römbke J, Spelda J (2000) Standortspezifische Erwartungswerte für die Gemeinschaftsstruktur ausgewählter Taxa der Bodenfauna als Bodenqualitätskriterium. Berichte des naturwissenschaftlich-medizinischen Vereins in Innsbruck 87: 365-379. Schnittler M, Ludwig G, Pretscher P, Boye P (1994) Konzeption der Roten Listen der in Deutschland gefährdeten Tier- und Pflanzenarten – unter Berücksichtigung der neuen internationalen Kategorien. Natur und Landschaft 69 (10): 451-459. Schuboth J, Peterson J (2004) Rote Liste der gefährdeten Biotoptypen Sachsen-Anhalts. Berichte des Landesamtes für Umweltschutz Sachsen-Anhalt 39: 20-33. Shear WA, Edgecombe GD (2010) The geological record and phylogeny of the Myriapoda. Arthropod Structure and Development 39: 174-190. Spelda J (1999) Provisorische Rote Liste der in Baden-Württemberg gefährdeten Hundert- und Tausendfüßer (Myriapoda: Chilopoda, Diplopoda). Stand: August 1997. Rote Listen auf CD-ROM, 44 pp. Spelda J (2004) Rote Liste gefährdeter Hundert- und Tausendfüßer (Myriapoda: Chilopoda, Diplopoda) Bayerns. Schriftenreihe Bayerisches Landesamt für Umweltschutz 166: 339-342. Spelda J, Voigtländer K, Lindner EN, Decker P, Reip HS (in press) Rote Liste der in Deutschland gefährdeten Hundertfüßer (Myriapoda: Chilopoda). In: Bundesamt für Naturschutz (BfN) (Ed): Rote Liste gefährdeter Tiere, Pflanzen und Pilze Deutschlands. Naturschutz und Biologische Vielfalt. Stoev P (2002) A Catalogue and Key to the centipedes (Chilopoda) of Bulgaria. Pensoft. Sofia-Moscow, 103 pp. Sukopp H (1974) „Rote Liste“ der in der Bundesrepublik Deutschland gefährdeten Arten von Farn- und Blütenpflanzen (1. Fassung). Natur und Landschaft 49 (12): 315-322. Voigtländer K, Düker C (2001) Distribution and species grouping of millipedes (Myriapoda, Diplopoda) in dry biotopes in Saxony-Anhalt/Eastern Germany. European Journal of Soil Biology 37: 325-328. Voigtländer K (2003a) Liste der Myriapoden Sachsen-Anhalts und des Kyffhäusers. I. Chilopoda. Entomologische Nachrichten und Berichte 47(3–4): 191-193. Voigtländer K (2003b) Hundertfüßer (Chilopoda). In: Schnitter P, Trost M, Wallaschek M (Eds). Tierökologische Untersuchungen in gefährdeten Biotoptypen des Landes Sachsen-Anhalt. I. Zwergstrauchheiden, Trocken- und Halbtrockenrasen. Entomologische Mitteilungen Sachsen-Anhalts, Sonderheft 2003: 26–195. Voigtländer K (2003c) Species distribution and assemblages of centipedes (Chilopoda) in open xeric sites of Saxony-Anhalt (Germany). African Invertebrates 44 (1): 283-291. Voigtländer K (2004a) Rote Liste der Doppelfüßer (Diplopoda) des Landes Sachsen-Anhalt. Berichte des Landesamtes für Umweltschutz Sachsen-Anhalt 39: 178-180. Voigtländer K (2004b) Rote Liste der Hundertfüßer (Chilopoda) Sachsen-Anhalts. Berichte des Landesamtes für Umweltschutz Sachsen-Anhalt 39: 175-177. Voigtländer K (2005) Habitat prefences of selected Central European Centipedes. Peckiana 4: 163-179. Species list of all German Diplopoda and Chilopoda including Red List status and frequency of occurrence (see Spelda et al. in press, Reip et al. in press for species discussion in detail).Abbreviations for Red List status: 1 – threatened with extinction, 2 – highly endangered, 3 – endangered, EU – endangerment of unknown extent, R – extremely rare, NT – near threatened, * – least concern, ♦ – not evaluated, D – data deficient. Abbreviations for Species: + – endemic species, ~ – alien species. Abbreviations for Frequency of occurrence: er – extremely rare, vr – very rare, r – rare, mf – moderately frequent, f – frequent, vf – very frequent, ? – unknown. ♦ Amphitomeus attemsi (Schubart, 1934) ~ ? ♦ Anamastigona pulchella (Silvestri, 1894) ~ ? ♦ Brachychaeteuma melanops Brade-Birks & Brade-Birks, 1918 ~ ? ♦ Brachyiulus lusitanus (Verhoeff, 1898) ~ ? ♦ Cylindrodesmus hirsutus Pocock, 1889 ~ ? ♦ Cylindroiulus vulnerarius (Berlese, 1888) ~ ? ♦ Mesoiulus gridellii Strasser, 1934 ~ ? ♦ Nanogona polydesmoides (Leach, 1815) ~ ? ♦ Ophyiulus germanicus (Verhoeff 1896) ~ ? ♦ Oxidus gracilis (C. L. Koch, 1847) ~ ? ♦ Paraspirobolus lucifugus (Gervais, 1836) ~ ? ♦ Poratia digitata (Porat, 1889) ~ ? ♦ Poratia obliterata (Kraus, 1960) ~ ? ♦ Prosopodesmus jacobsoni Silvestri, 1910 ~ ? ♦ Rhinotus purpureus (Pocock, 1894) ~ ? ♦ Stosatea italica (Latzel, 1886) ~ ? ♦ Cryptops anomalans Newport, 1844 ~ ? ♦ Geophilus osquidatum Brölemann, 1909 ~ ? ♦ Henia brevis (Silvestri, 1896) ~ ? ♦ Lamyctes emarginatus (Newport, 1844) ~ ? ♦ Mecistocephalus maxillaris (Gervais, 1837) ~ ? ♦ Scutigera coleoptrata (Linnaeus, 1758) ~ ? ♦ Stenotaenia linearis (C. L. Koch, 1835) ~ ?